Welcome to John Jordan’s new reoccurring column where he’ll dig through his album collection to ruminate on the gold he’s accumulated over the years. Does anyone else out there remember when pop vocalists could actually sing? Not have their tracks endlessly cut, processed and extruded by technology – not struggle to over-emote every phrase until all soul has been wrung from the lyric – but could just, you know, sing? 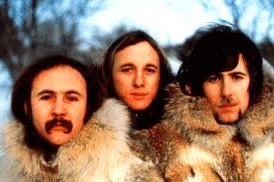 David Crosby, Stephen Stills and Graham Nash could really sing. They came together from other popular groups of the 1960s (The Byrds, Buffalo Springfield and The Hollies respectively) and discovered that together they could sing even better. On their self-titled debut (before the fire and madness that would come with Neil Young) Crosby, Stills and Nash produced stunning vocal leads, counterpoints, improvisations, and some of the most heartbreakingly beautiful harmonies ever committed to a popular recording. Stills also plays lead guitar, organ and bass while Crosby plays rhythm guitar, alongside session drummer Dallas Taylor, a wonderful instrumental backdrop is provided for the group’s vocal heroics. Now I am not necessarily averse to distorted, shouted, or even grunted vocals. This will become evident in this column as I get around to spinning some albums I can’t play unless my wife is out of the apartment. She is usually patient with my odder tastes but frankly she will initiate divorce proceedings if she has to listen to the entirety of Celtic Frost’s catalogue. Sometimes though it is good to be reminded what properly trained singers can accomplish when a few get together and their Muses strike the lot of them about the head with a twenty pound sledge. Crosby, Stills and Nash is an album that masterfully blends rock, country and folk music, seasoned with the blues and the barest yet pleasant hint of psychedelia for good measure. If this album has a shortcoming it turns out to be a particular lyrical convention, one that may have made perfect sense in the burgeoning folk- and country-rock scenes of late 1960s Los Angeles but now rings out as both condescending and creepy. Addressing women as “Lady,” or the even more jarring “Mi’Lady.” Crosby’s otherwise lovely song “Guinnevere” is the big offender on this count. I know the term is supposed to come across as respectful and charming in a nouveau-renaissance-troubadour sort of way, and probably did back when the audience was wearing caftans and fringed suede coats, but this turn of phrase sounds just awful today. There is a near 100-percent chance that at some romantic low point in my life I put the tracks “Helplessly Hoping” or “49 Bye-Byes” on a mix tape, trying to indirectly convey my burning feelings through the power of CSN’s artistry. Give them a listen and you will inevitably be tempted to do the same. While this was, I am absolutely certain, preferable to sharing any poetry I have ever written, it was still pretty lame. Sometimes I just hate being reminded of when I was a bit moist, had my own pair of fringed moccasins, and thought hippies were pretty okay rather than in need of a wash.
It’s a testament to the strength of this album that in spite of the problems with gender identification terms and my general disdain for anyone who identified themselves as members of the Love Generation, Crosby Stills & Nash remains a stunner of an accomplishment over 40 years after its release. The opening track “Suite: Judy Blue Eyes” is majestic, Stills’ and Crosby’s dark, plaintive “Wooden Ships” (co-written with Paul Kantner of Jefferson Airplane, who did their own version on Volunteers the same year) and Crosby’s soulful “Long Time Gone” are reflections of the very real tensions underlying the Summer of Love. Nash’s “Marrakesh Express” is a playful and joyous confection of a tune, and “Pre-Road Downs” is a rollicking slice of good-time blues. For goodness sake, every track on the album is worth a listen, and the majority outright triumphs.